INTERNET RECHARTERING UNIT RENEWAL Statement of Objectives We hope that this overview will help you as the Unit Renewal Processor to complete this important task more easily. 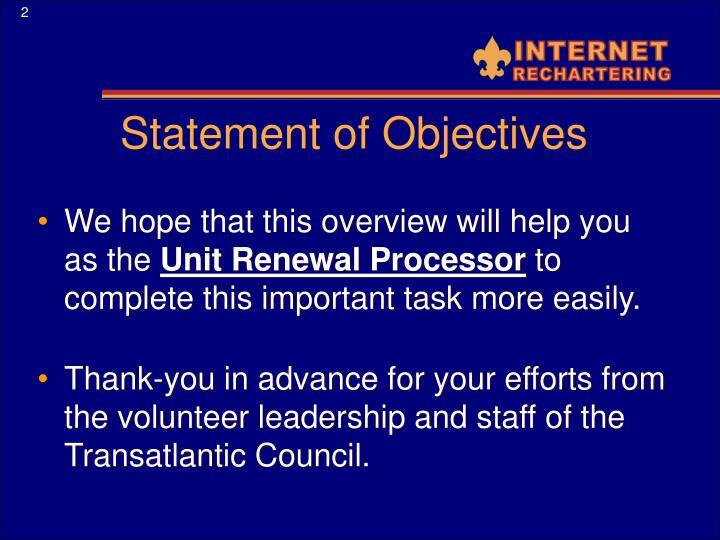 Thank-you in advance for your efforts from the volunteer leadership and staff of the Transatlantic Council. 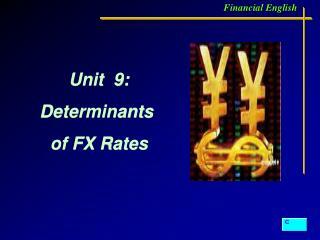 We hope that this overview will help you as the Unit Renewal Processor to complete this important task more easily. Thank-you in advance for your efforts from the volunteer leadership and staff of the Transatlantic Council. 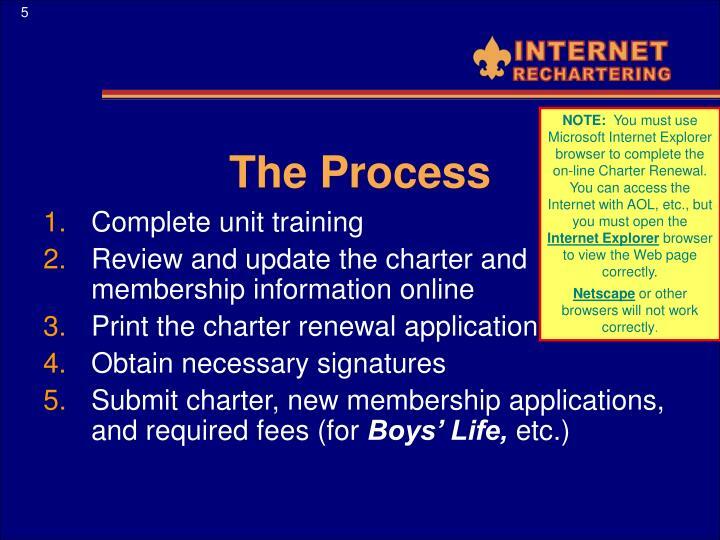 The annual process of registering the membership of the Boy Scouts of America. An opportunity to review and verify the membership information of each individual and to make sure they are enrolled in the proper positions and programs. 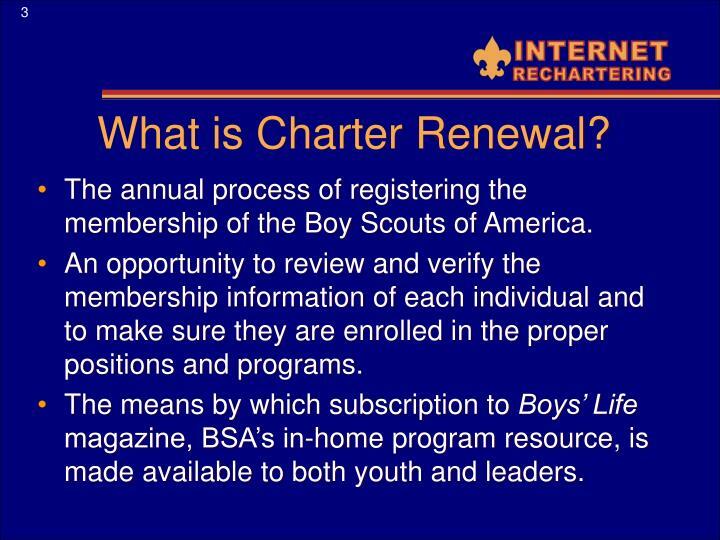 The means by which subscription to Boys’ Life magazine, BSA’s in-home program resource, is made available to both youth and leaders. 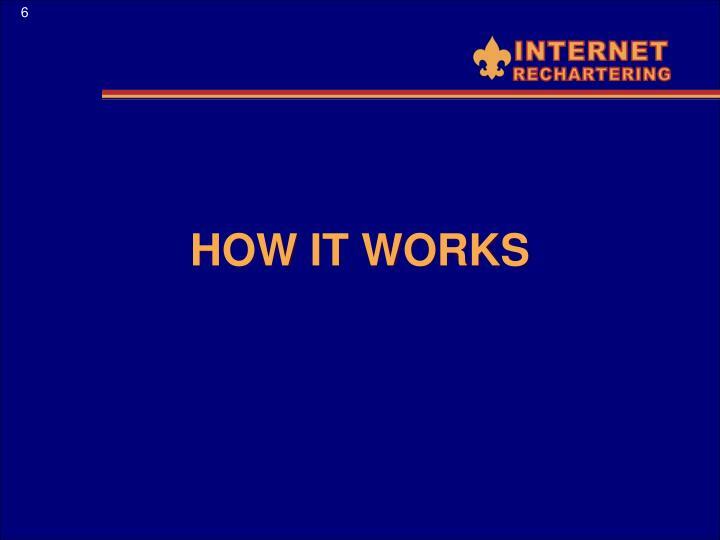 Benefitsof Renewing your Charter over the Internet. 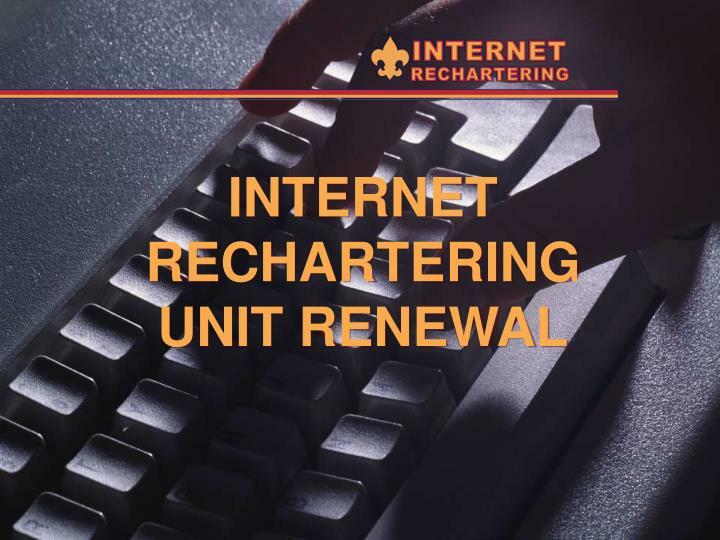 NOTE: You must use Microsoft Internet Explorer browser to complete the on-line Charter Renewal. 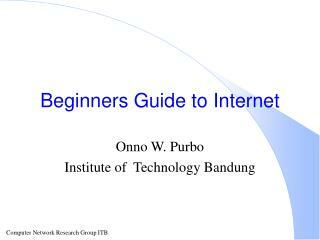 You can access the Internet with AOL, etc., but you must open the Internet Explorer browser to view the Web page correctly. 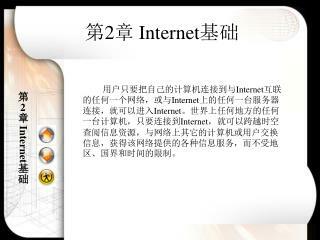 Netscape or other browsers will not work correctly. 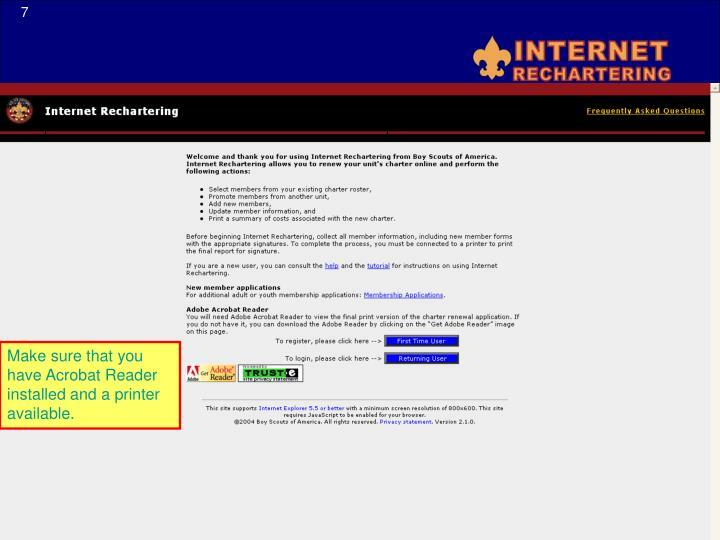 Make sure that you have Acrobat Reader installed and a printer available. 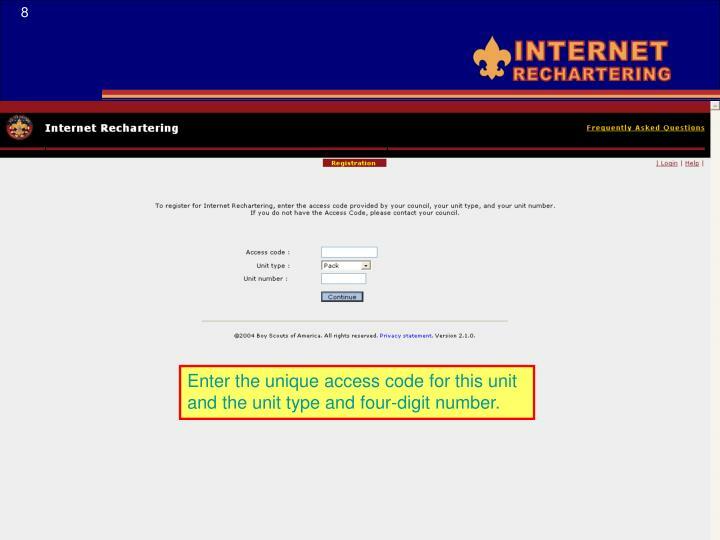 Enter the unique access code for this unit and the unit type and four-digit number. 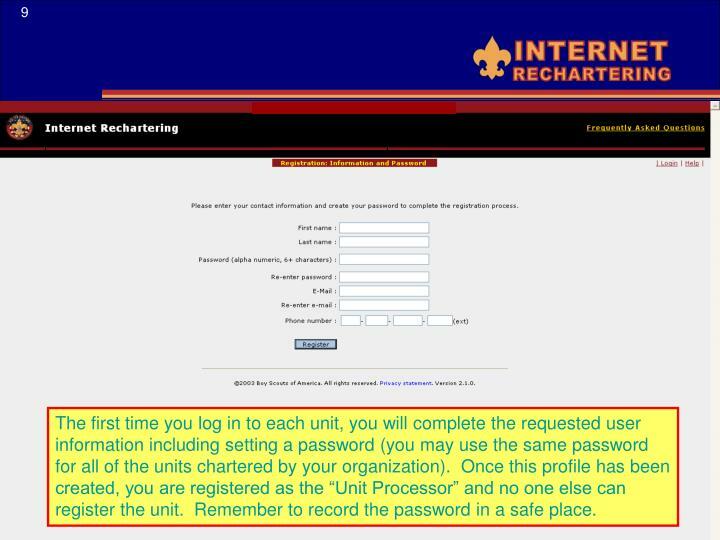 The first time you log in to each unit, you will complete the requested user information including setting a password (you may use the same password for all of the units chartered by your organization). 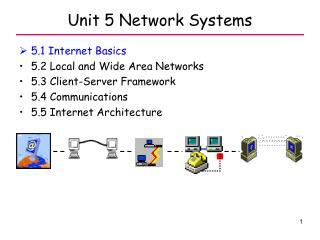 Once this profile has been created, you are registered as the “Unit Processor” and no one else can register the unit. Remember to record the password in a safe place. You receive your unit roster information from one of two sources. Unit-management software, such as TroopMaster, can provide a file that can be uploaded. 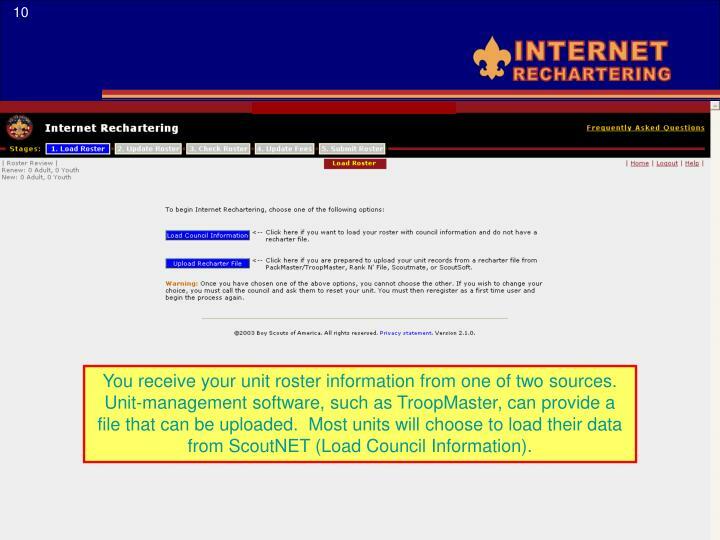 Most units will choose to load their data from ScoutNET (Load Council Information). 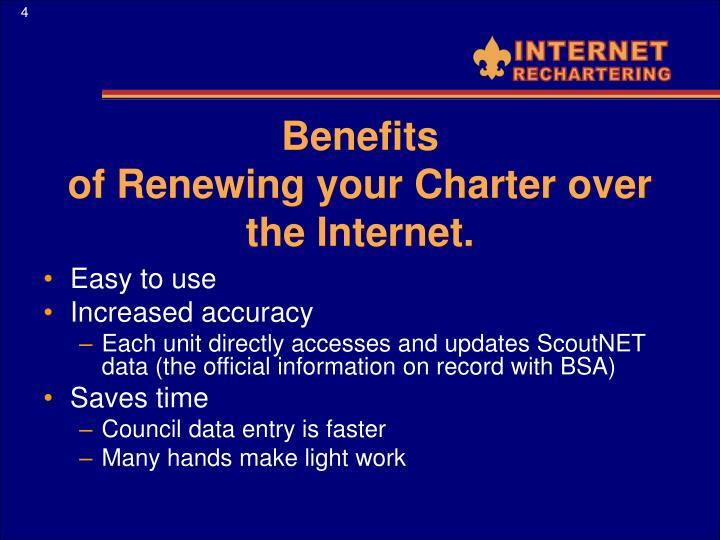 Remember, you may logout at any time during the online Charter Renewal process. The work you have done will be saved and you will be able to return and pick up where you left off. 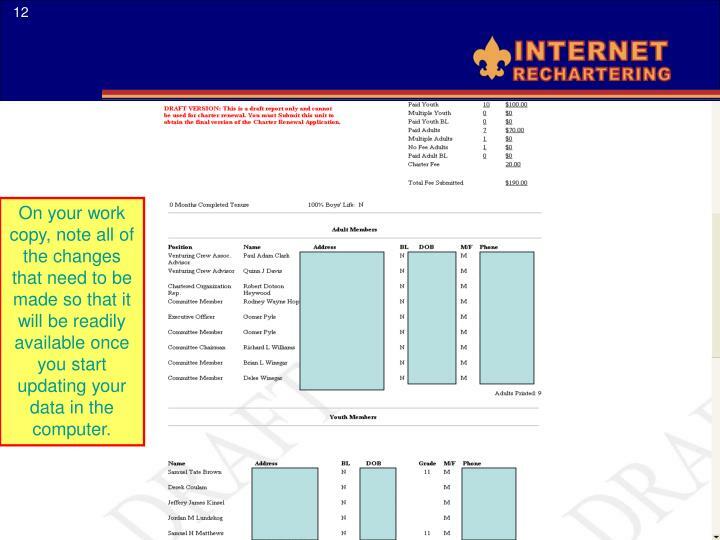 At this point, we suggest that you print out a paper copy of your roster as a “work copy”. 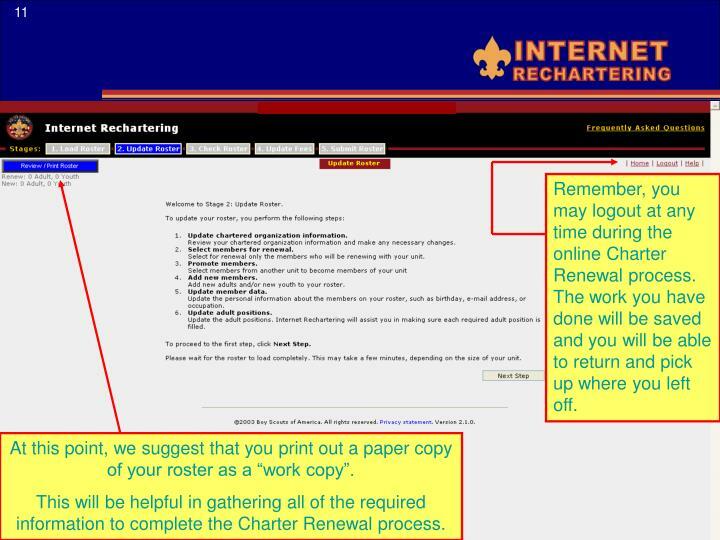 This will be helpful in gathering all of the required information to complete the Charter Renewal process. On your work copy, note all of the changes that need to be made so that it will be readily available once you start updating your data in the computer. 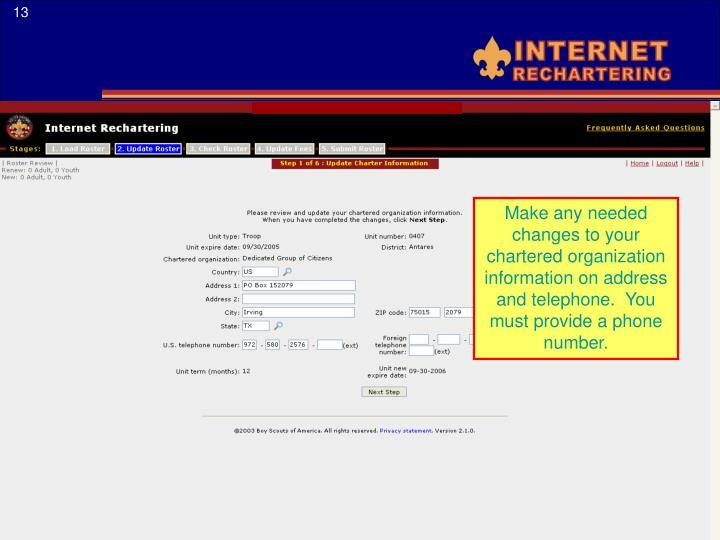 Make any needed changes to your chartered organization information on address and telephone. You must provide a phone number. 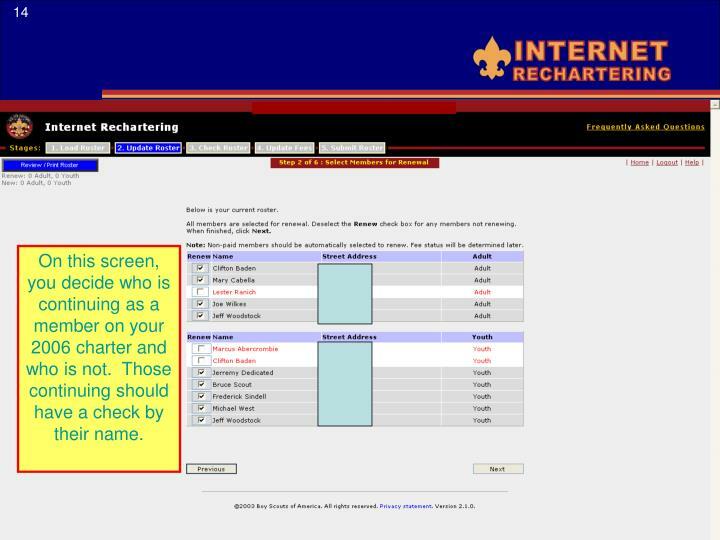 On this screen, you decide who is continuing as a member on your 2006 charter and who is not. Those continuing should have a check by their name. 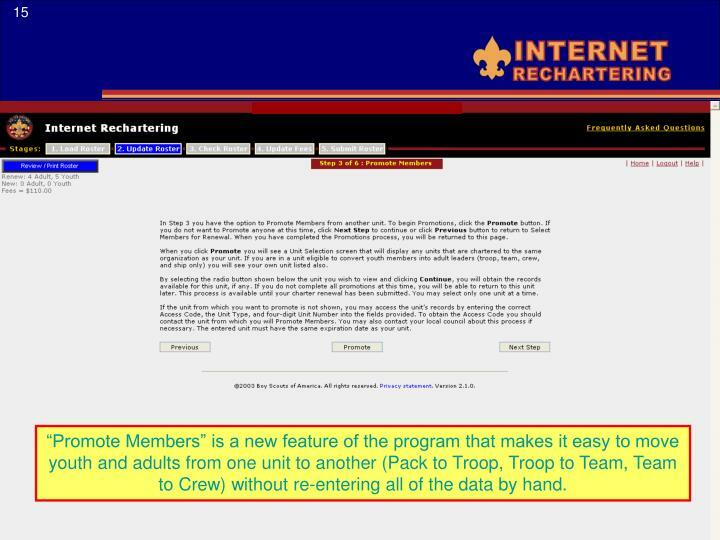 “Promote Members” is a new feature of the program that makes it easy to move youth and adults from one unit to another (Pack to Troop, Troop to Team, Team to Crew) without re-entering all of the data by hand. Select the Unit that you want to import members from and click “Next”. 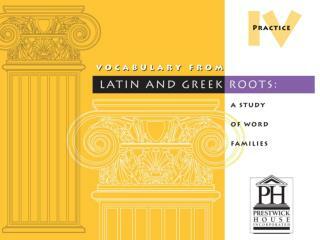 You may import either age eligible youth and/or adults from any unit listed. 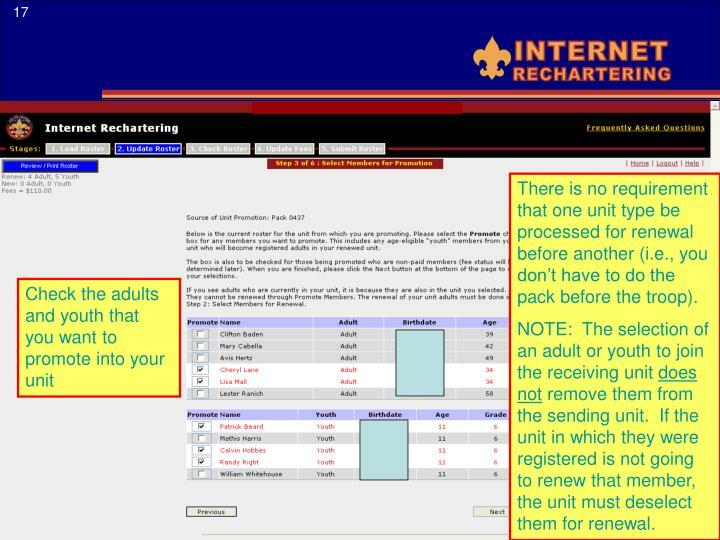 There is no requirement that one unit type be processed for renewal before another (i.e., you don’t have to do the pack before the troop). NOTE: The selection of an adult or youth to join the receiving unit doesnot remove them from the sending unit. If the unit in which they were registered is not going to renew that member, the unit must deselect them for renewal. 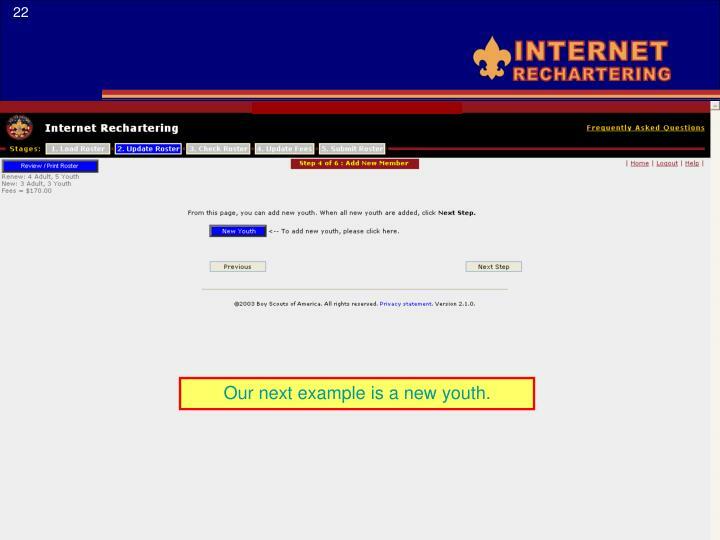 Next, you can add new adults and youth. Our first example will register a new adult. Do not check this box,unless the adult is moving into your unit from another council and has a current membership card that expires after your unit expiration date. 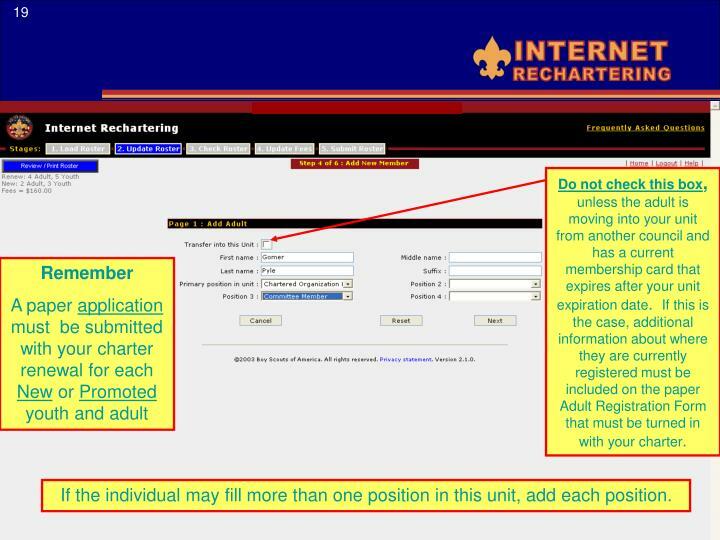 If this is the case, additional information about where they are currently registered must be included on the paper Adult Registration Form that must be turned in with your charter. 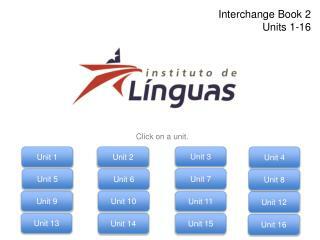 If the individual may fill more than one position in this unit, add each position. 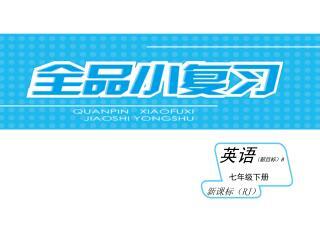 The next step is to complete the needed information about the individual. Anytime there is a magnifying glass, you can make your selection from a list. 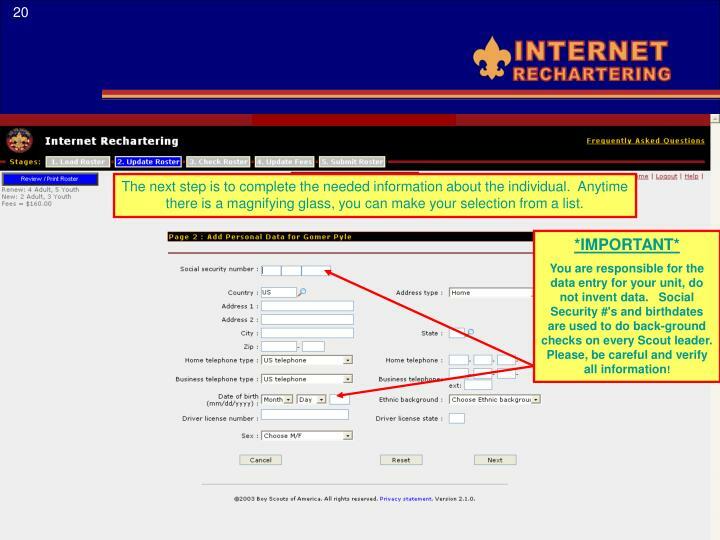 You are responsible for the data entry for your unit, do not invent data. 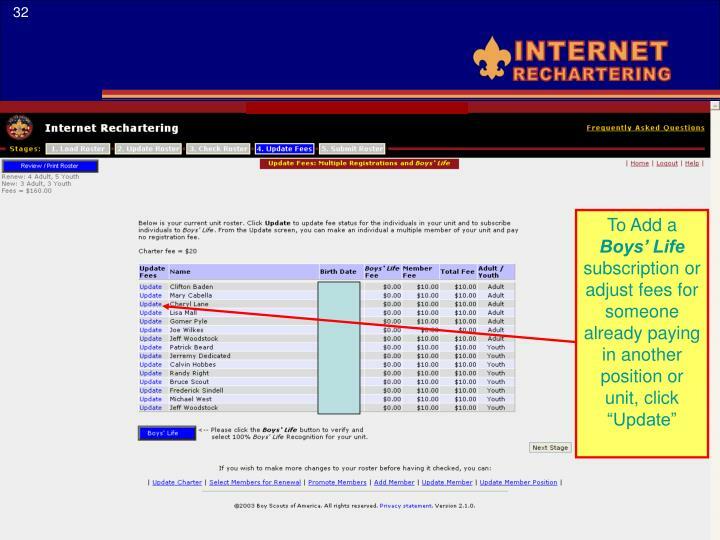 Social Security #'s and birthdates are used to do back-ground checks on every Scout leader. Please, be careful and verify all information! 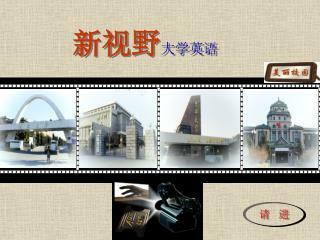 If e-mail address is available, please enter it. This will enable the council to communicate important program information to leaders in a faster and more efficient manner for up coming events. Our next example is a new youth. 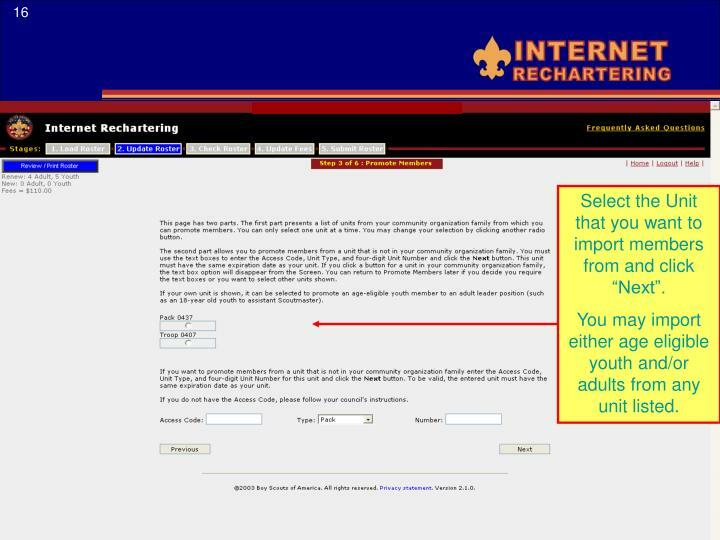 Do not check this box,unless the youth is moving into your unit from another council and has a current membership card that expires after your unit expiration date. 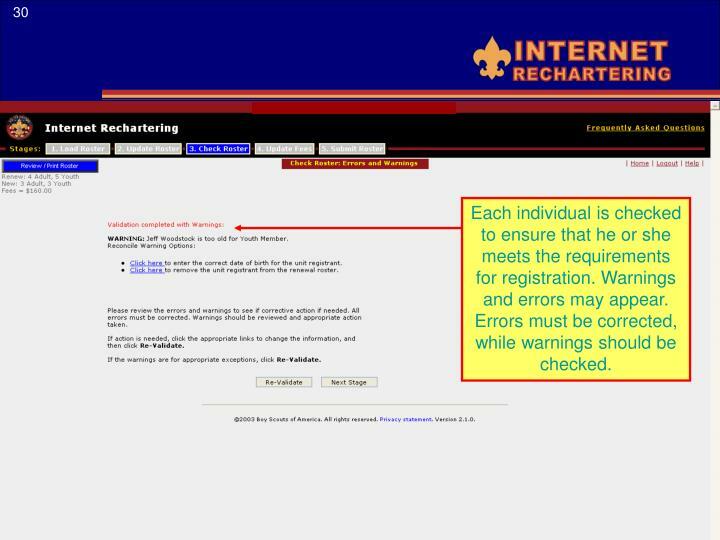 If this is the case, additional information about where they are currently registered must be included on the paper Registration Form that must be turned in with your charter. 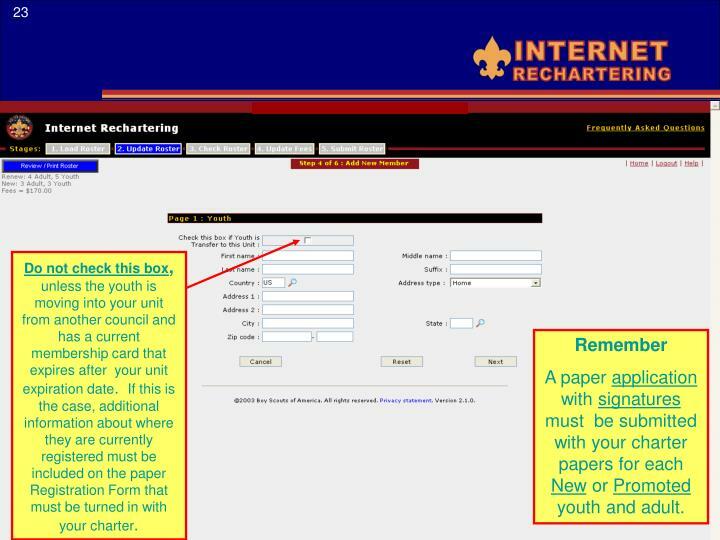 A paper application with signatures must be submitted with your charter papers for each New or Promoted youth and adult. 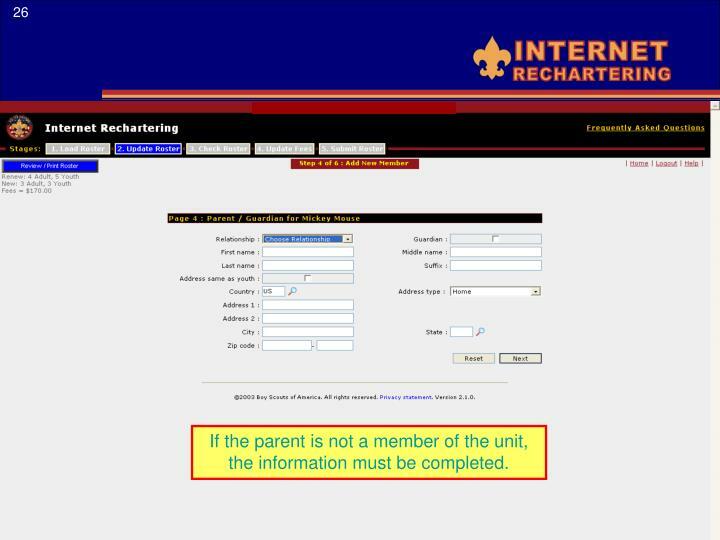 You must select if the parent is or isn’t a current member of the unit. 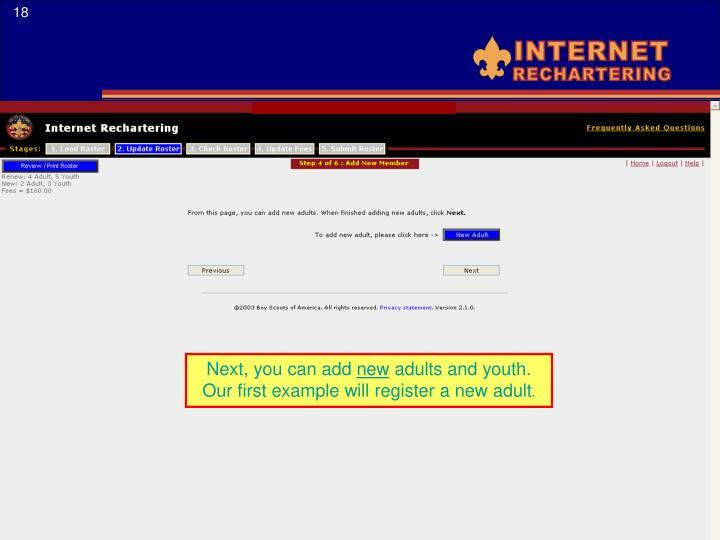 For this reason, it’s a good idea to enter any new adults first. 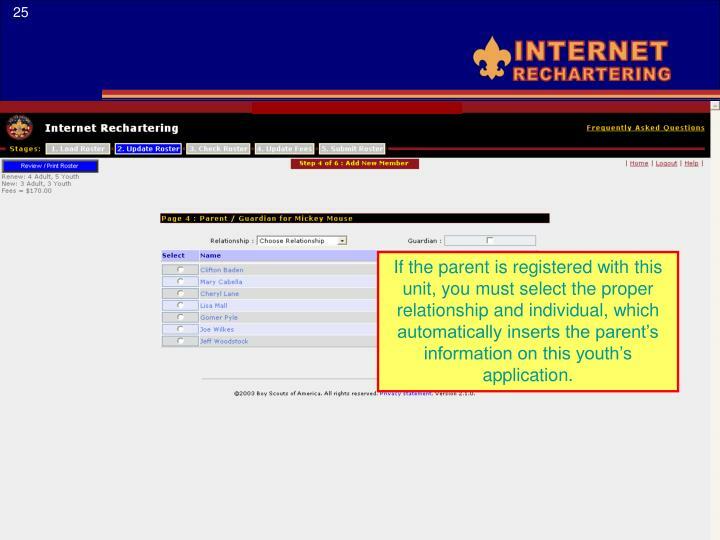 If the parent is registered with this unit, you must select the proper relationship and individual, which automatically inserts the parent’s information on this youth’s application. 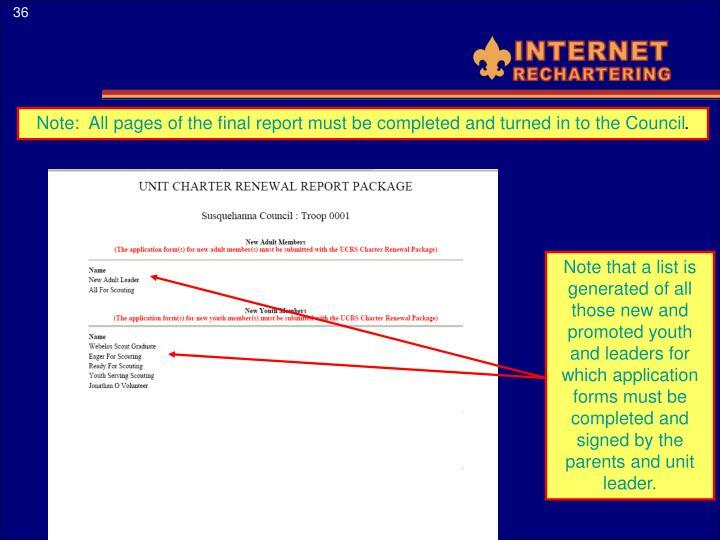 If the parent is not a member of the unit, the information must be completed. 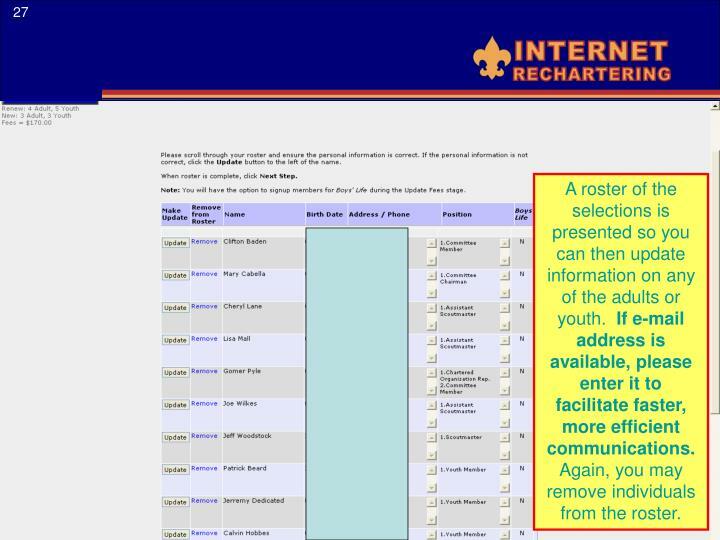 A roster of theselections is presented so you can then update information on any of the adults or youth. 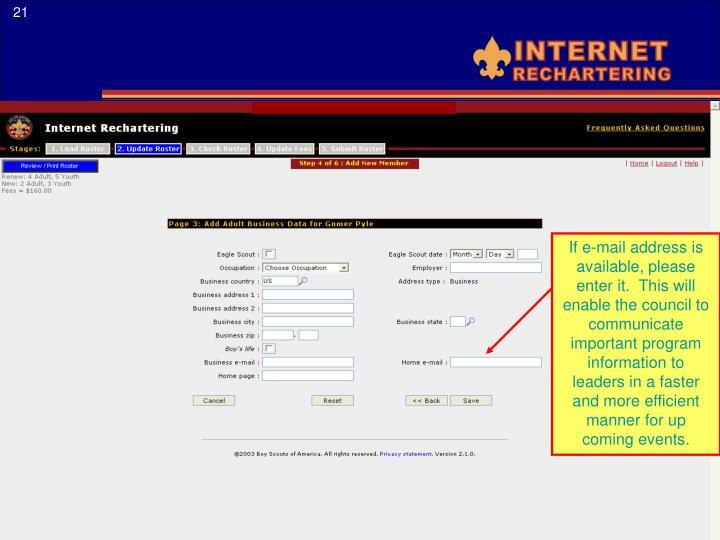 If e-mail address is available, please enter it to facilitate faster, more efficient communications. Again, you may remove individuals from the roster. A listing of adults filling required positions is presented with a table of the minimum and maximum requirements and the current status. 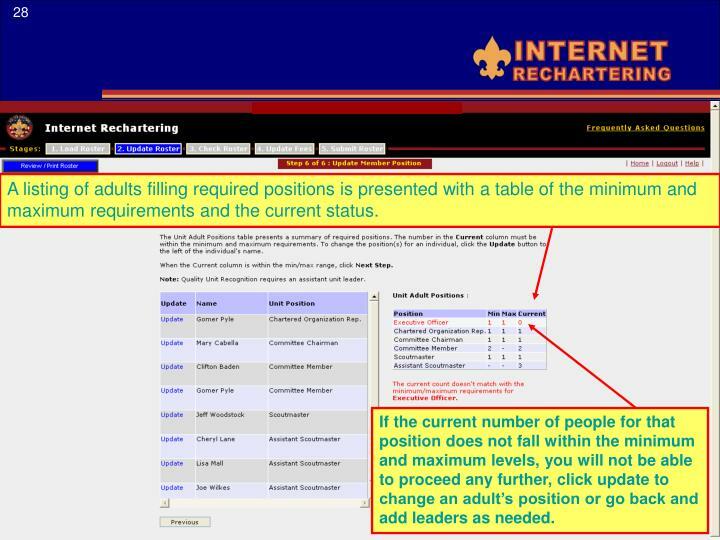 If the current number of people for that position does not fall within the minimum and maximum levels, you will not be able to proceed any further, click update to change an adult’s position or go back and add leaders as needed. 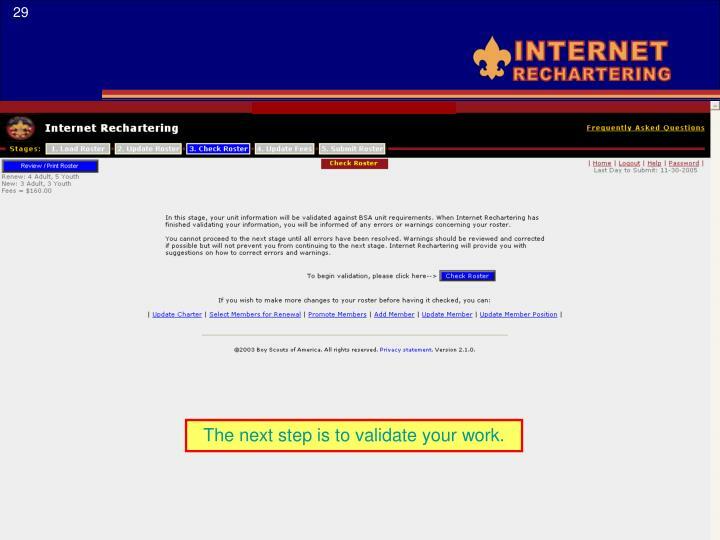 The next step is to validate your work. 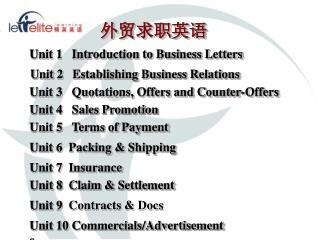 Each individual is checked to ensure that he or she meets the requirements for registration. Warnings and errors may appear. Errors must be corrected, while warnings should be checked. 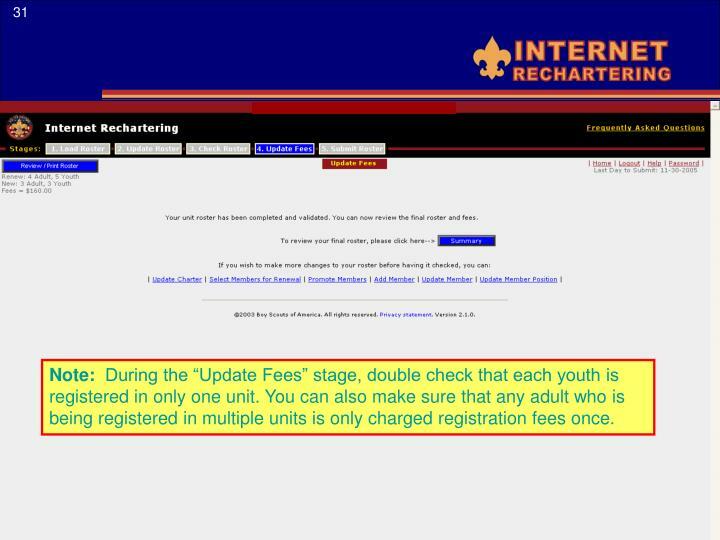 Note: During the “Update Fees” stage, double check that each youth is registered in only one unit. 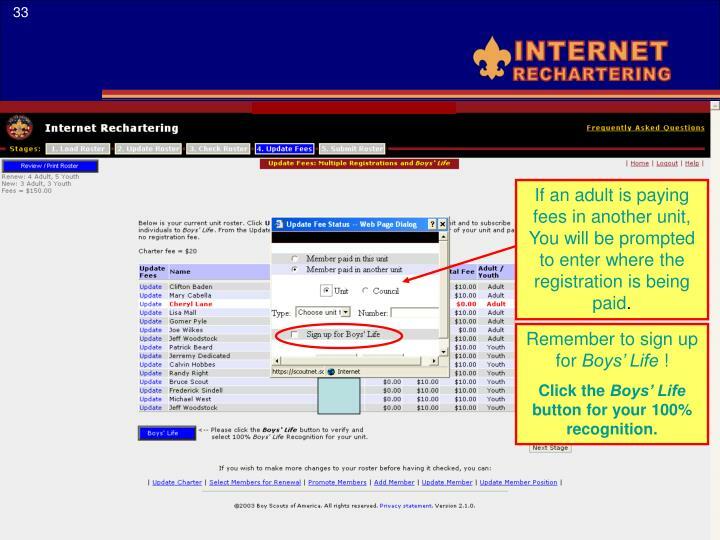 You can also make sure that any adult who is being registered in multiple units is only charged registration fees once. If an adult is paying fees in another unit, You will be prompted to enter where the registration is being paid. Remember to sign up for Boys’ Life ! Click the Boys’ Life button for your 100% recognition. Changes made in the “Update Fees” process will be displayed. 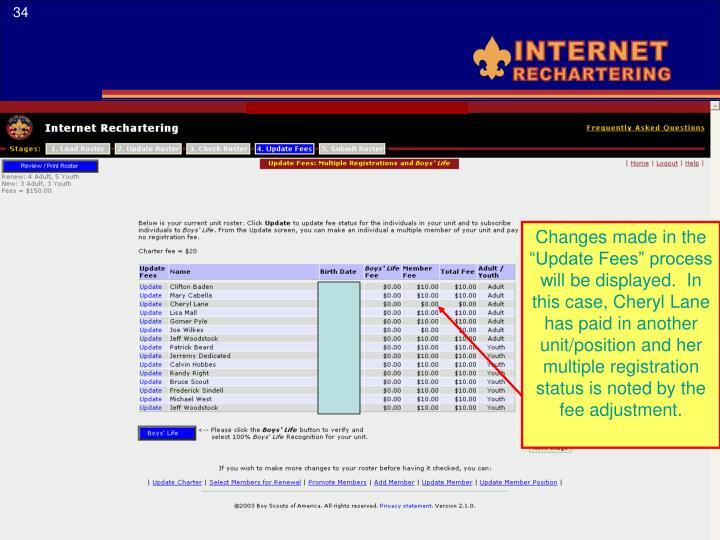 In this case, Cheryl Lane has paid in another unit/position and her multiple registration status is noted by the fee adjustment. 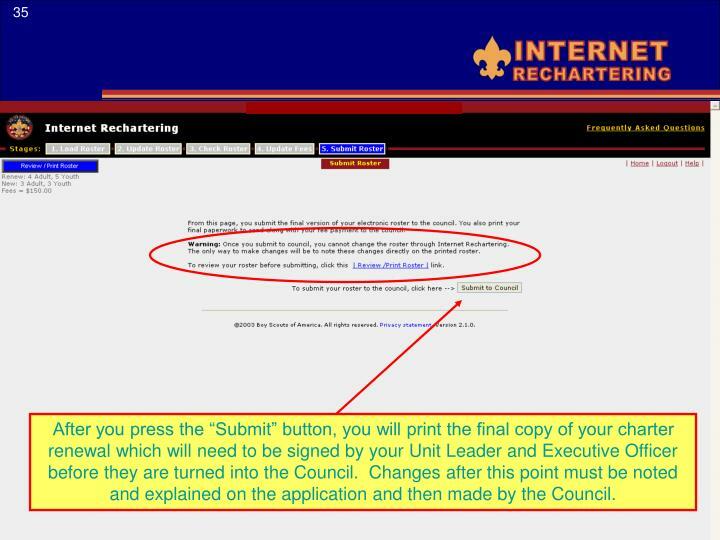 After you press the “Submit” button, you will print the final copy of your charter renewal which will need to be signed by your Unit Leader and Executive Officer before they are turned into the Council. Changes after this point must be noted and explained on the application and then made by the Council. Note: All pages of the final report must be completed and turned in to the Council. Note that a list is generated of all those new and promoted youth and leaders for which application forms must be completed and signed by the parents and unit leader. 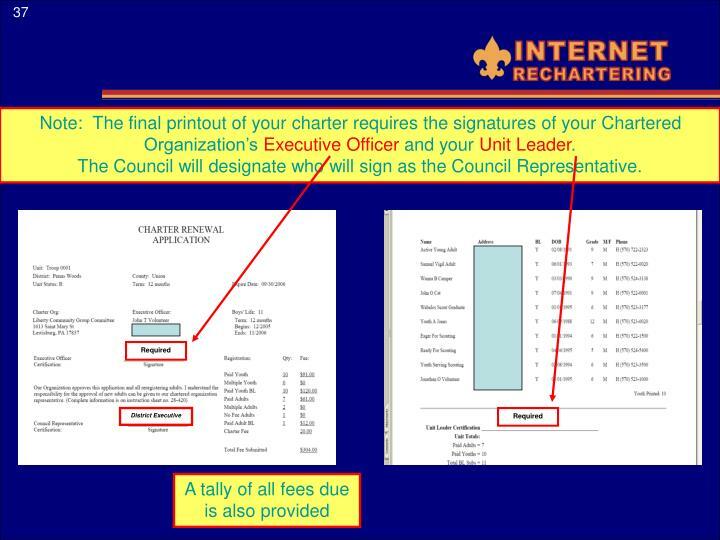 Note: The final printout of your charter requires the signatures of your Chartered Organization’s Executive Officer and your Unit Leader. The Council will designate who will sign as the Council Representative. 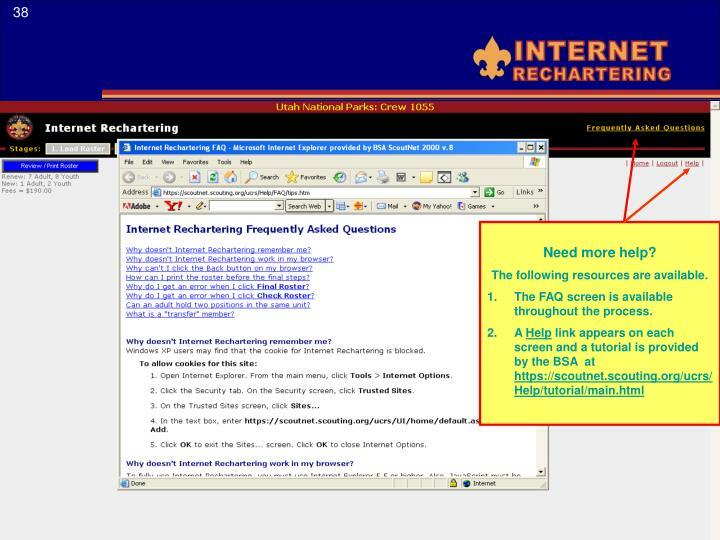 The FAQ screen is available throughout the process. 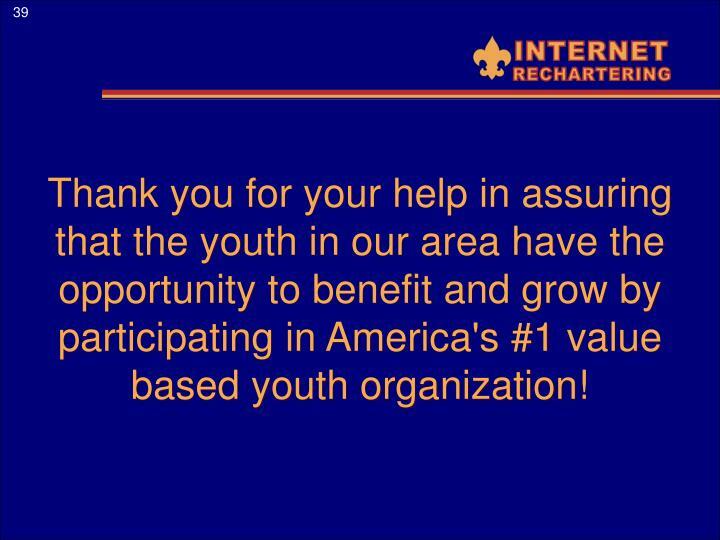 Thank you for your help in assuring that the youth in our area have the opportunity to benefit and grow by participating in America's #1 value based youth organization!